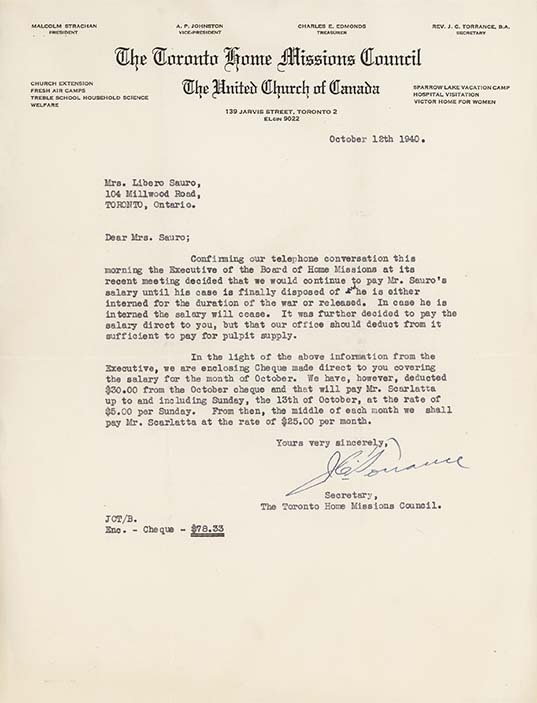 Letter from Toronto Home Missions Council, to Mrs. Libero Sauro, October 12, 1940. The majority of internees were men with families, and often the sole breadwinners. The assets of most internees were seized by the Custodian of Enemy Property. Bank accounts were frozen. Wives, or other family members, had to request the government’s permission to access funds. The women did whatever it took to make ends meet. In this letter, Clementina is informed by the United Church that she will continue to receive her husband's pay, although reduced, until the outcome of his hearing. This is a unique example. In fact, in other circumstances, families had to fight to receive the last pay righfully due to their husbands.